You can change the appearance of the message list and reading pane in Outlook.com. Choose whether your messages should be sorted into Focused and Other tabs and whether you want your email displayed as individual messages or as conversations. 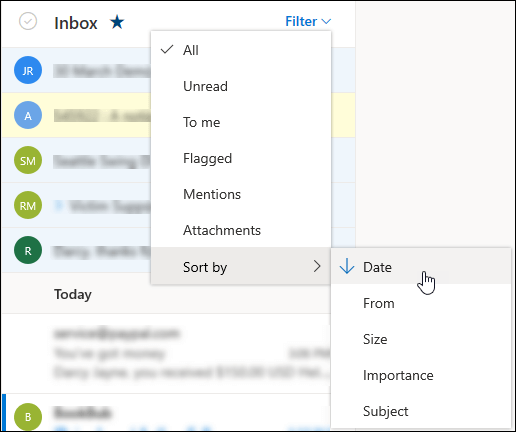 To change the layout of the message window, at the top of the page, select Settings > View all Outlook settings > Mail > Layout. At the top of the message list, select Filter. Select Sort by and choose how you want to sort your email. At the top of the page, select Settings to open Quick settings. To sort messages by conversation, select Newest messages on top or Newest messages on bottom. To show email as individual messages, select Off. Next to Focused Inbox, select the toggle to turn Focused Inbox on or off.